Cheese Tasting at Melton Cheeseboard01664 562257work ExperienceLocated in the heart of the traditional market town Melton Mowbray, famed for its Stilton Cheese, the Melton Cheeseboard has the widest range of cheeses in the county with over 150 to choose from. On this gourmet experience you will enjoy a pre-arranged tasting session of famed and local Leicestershire cheese. Located in the heart of the traditional market town Melton Mowbray, famed for its Stilton Cheese, the Melton Cheeseboard has the widest range of cheeses in the county with over 150 to choose from. Please call to arrange cheese tasting session, group visits must be pre-booked. Please call for group rates. 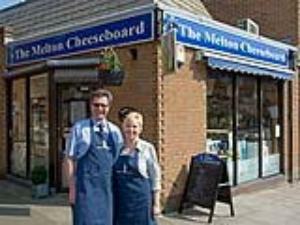 Melton Cheeseboard is conveniently situated in the town centre.